Do you sprain your ankles? if so read this! 1. What is chronic ankle instability, and how does this differ from people who have only had one sprain? Chronic ankle instability (CAI), interestingly enough, is a very difficult (sometimes frustrating) syndrome to define. There is an ongoing discussion for a common description of CAI; however as of now, there is not a universally accepted definition. Some researchers rely purely on subjective reporting of symptoms by patients, while others, require some type of mechanical dysfunction to be present at the ankle joint, while still others desire a history of multiple ankle sprains. And of course, there are some who use any combination of the three. The majority of researchers (myself included) will described CAI as the long-term feelings of your ankle giving way or weakness following an initial ankle sprain. This can occur as a result of a single ankle sprain or from an accumulation of multiple sprains. Many subjects/patients claim to “tweak” their ankles all the time. It is estimated that about 30-60% of individuals that sustain an initial lateral ankle sprain will develop CAI. There is a group of individuals who sprain their ankle once and who do not go on to develop CAI; researchers are currently using the term “coper” to describe these individuals. Research is relatively new on this population. What about them results in a full recovery from their ankle sprain? Was the sprain different or was something regarding their rehabilitation different? Are there other characteristics of these individuals that reduce their feeling of instability? Or, have they changed their lifestyle to not put themselves at risk for “tweaking” their ankle? This is a very exciting area of research because, our goal as a clinician is to prevent CAI from occurring and since we probably won’t ever figure out how to actually prevent ankle sprains from happening; we would like to determine how to get all ankle sprainers to become copers. 2. Why did you choose this topic to research? I am an Athletic Trainer by profession. While working with various sports, at various levels, and multiple age groups one injury I always encountered were ankle sprains. No matter who you are, there is a risk of suffering an ankle sprain. With my background in athletic training and my exposure to the injury, when I decided to go to the University of Virginia for my doctorate I decided that I wanted to focus my research on ankle sprains and ankle instability. Being at UVA gave me access to prominent ankle researchers and an unbelievable motion analysis laboratory which I took advantage of. This particular study was developed as a progression from a previous study conducted at the lab. A couple of years prior to my arrival to UVA, Lindsay Drewes (now Lindsay Sauer) and Patrick McKeon, conducted a similar study in CAI subjects, however, their data was collected while subjects were barefoot (Drewes et al., 2009; Drewes, McKeon, Kerrigan, & Hertel, 2009). Their studies reported some interesting findings; however asking individuals to perform barefoot tasks is novel, so I wanted to replicate the study while subjects were shod (shod means in shoes), a more common/comfortable condition. 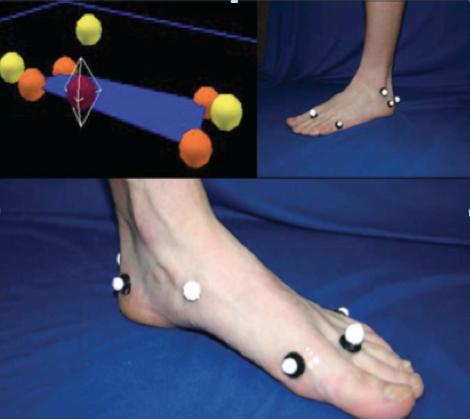 Interestingly, unlike previous gait research on CAI subjects, we did not find kinematic differences just prior to, at, or immediately following initial contact. I think adding shoes to our methods has revealed altered kinematics that barefoot methods had not previously done. Our kinematic differences occurred towards terminal stance as well as during swing. One thing to note is; no one really understands when ankle sprains occur, it has been hypothesized that they may occur either at initial contact OR terminal stance (Konradsen & Voigt 2002). However the majority of research has only focused on initial contact. Our study actually evaluated the entire gait cycle finding difference at terminal stance is very new and original. Hopefully this will encourage more researchers to evaluate the later stages of gait in the future. 4. Given that the previous research was using people walking/running barefoot, what do you think adding shoes into the equation helps? Adding shoes to the research has added a piece to the mysterious CAI puzzle. Before I discuss what shoes added, let me explain a little about the shoes we used. We were able to obtain multiple pairs (both men and women sizes) of Brook Defyance shoes. Collaborating closely with Brooks, we were able to remove various aspects of the shoe to enable us to place anatomical markers on a subject’s skin without disrupting the integrity of the shoe. Placing markers on the skin allowed us to better observe joint kinematics. Placing markers on top of shoes (which has been done in the past) only allows researchers to observe what the shoe is doing. Shoes may slip or move differently than the joint. Our goal was to see what each individual’s limb was doing, which with this custom shoe we were able to do. So, getting back to your question, I believe incorporating shoes, specifically our custom shoes, has significantly contributed the CAI literature. Previous research has shown that there are kinematic differences and muscle activation differences between running barefoot and shod (Kerr et al 2009, De Wit et al 2000, Burkett et al 1985). If anyone has ever tried to go and run barefoot (outside or on a treadmill) without weeks of acclimation, your feet hurt and your gait naturally changes in order to adequately absorb forces. The majority of previous CAI literature asked their subjects to perform this novel task of running barefoot. Knowing that gait changes, we are unsure if their findings are due to the task or due to CAI or both. Allowing our subjects to wear shoes, we were able to capture a more natural gait stride. Secondly, plantar stimulation has been shown to affect CAI subjects differently than healthy controls. Placing shoes on our subjects may have provided some stimulation that barefoot gait does not. Plus, being an athletic trainer, I always want to try to mimic what athletes do and there are not many sports that train or compete barefoot. 5. Can you make any recommendations based on this study? I think the most important recommendation I have for clinicians and athletes is not to shrug an ankle sprain off as “just” an ankle sprain. This study as well as the majority of CAI literature shows that individuals with CAI have both local and global alterations compared to healthy controls. We also know that CAI has been linked to osteoarthritis. This study specifically shows that gait changes can be observed. After suffering from an ankle sprain and those who have CAI should evaluate their rehabilitation and not hurry back to activity. Therapists can incorporate gait re-training exercises into rehabilitation. 6. What questions remain unanswered about the effects of CAI on athletes? Oh so many! As any researcher will tell you, as we answer one question it seems like 10 more pop up. I touched upon this previously, but I think the three most important unanswered questions pertaining to CAI are, 1) What causes it? 2) Can we prevent it? and, 3) How do we best treat it? I know these are three very broad questions, but it’s what all CAI researchers are striving to determine. 7. Describe your new career/research interest for us? Since leaving UVA about a year ago and starting here at Kent State University, my overall research focus has not changed; I still want to better understand CAI and determine how to prevent CAI. However, because I do not have access to a state-of-the-art motion analysis lab my methods are shifting a bit. Neuromuscular control, balance, and proprioception are, in my opinion, the keys to ankle sprain rehabilitation. I am implementing various interventions on individuals with CAI in hopes to determine the most effective way to treat this syndrome. So…..for those of you wanting a simple summary. Here it is. People who keep spraining their ankles walk and run different from those who don’t sprain frequently. While some of you may say “who cares” – this is pretty important stuff. You see, all the gait research out there says something pretty simple. Variability is good. Its good to have slightly different ways to move. This way, when you get into “interesting situations” (like when you plant your foot slightly wrong) you have a skill set in place to correct your ankle position and save your body from injury. But this study shows that the pattern of people with CAI is different. And since these people keep spraining, one could say this compensated pattern really isn’t working….and is likely a big contributing factor to their ongoing issues. From the clinical side, its a good idea to improve the stability of your foot and ankle. Strong muscles inside the feet means less stress to the joint and better proprioception for faster stability, which both reduce injury risk. Want some more? Check out foot some specific foot strengthening exercises in my book, and on this video below (right about 3:22). Lastly, I’d like to say thanks to Lisa for all her work on this project, and thanks to Brooks for supplying shoes, and helping to ensure that the modifications we made to the study shoes to get 3D markers on the foot did not alter the function of the shoe during walking and running. If you’d like to contact Dr Chinn for additional questions, feel free to contact her below. This entry was posted in cycling, rehab, running, triathlon, Uncategorized and tagged Anatomy for Runners, Dicharry, dicharry blog, foot, form, gait, gait analysis, injury, physical therapist, physician, rebound physical therapy, Running injury barefoot minimalist, running shoes, stretching, UVA SPEED Clinic on June 25, 2013 by an athlete's body.